PUANGA 3rd to 30th June - the time to celebrate the Maori new year. Each year in June, the stars of Matariki and Puanga signal the end of one year and the start of the next. Puanga also known as Rigel appears in the north eastern horizon in late May or early June. 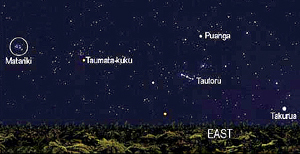 Some Iwi recognize and celebrate a different cluster of stars called Puanga or Puaka. Matariki, Puanga or Puaka are generally celebrated during the months of June and July. Common principles apply to all celebrations whether they are Matariki, Puanga or Puaka. It's a celebration of culture, language, spirit and people.The pre-dawn rise of Puanga, Matariki can be seen in the last few days of May every year. The new moon can be seen for the first time on these dates. In Taranaki it is called Puanga. Matariki is our Aotearoa Pacific New Year. Matariki is the name for a small cluster of tiny stars also known as the Pleiades. Astronomers generally refer to Matariki as Pleaides. This cluster of stars is well known across the globe, signifies Maori new year, acts as a key navigation beacon for ocean voyagers, as well as an important signal for seasonal celebration in many countries.The cluster is a group of many hundreds of stars about 400 light years from Earth and has been recognised since ancient times. The brightest stars are quite easy to see with the unaided eye in Greek legend bear the names of Seven Sisters, the daughters of Atlas and Pleone, Alcyone, Merope, Asterops, Maia, Taygeta, Calaeno and Electra. From the 18 to the 24th June, North Taranaki have a programme of events and activities on offer.